What Is the True Cost of Living in San Francisco? Forget flowers in your hair. If you’re going to San Francisco, be sure to have some extra change to spare. Thanks to skyrocketing home prices, and an increasingly competitive rental market, that’s the new message for anyone who is thinking about moving to the City by the Bay. 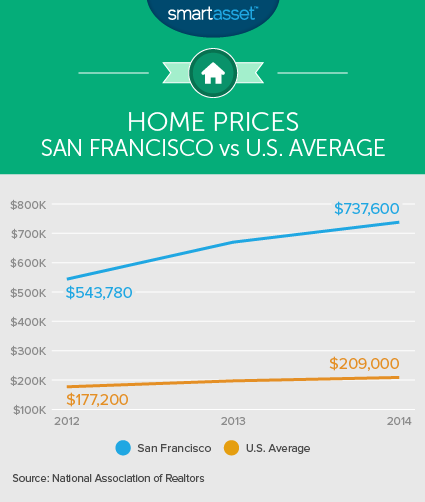 Just how expensive has San Fran gotten? Well, according to the Council for Community and Economic Research, the total cost of living in San Francisco is 62.6% higher than the U.S. average—and housing is nearly three times more expensive than in other U.S. cities. Below, we’ll take an in-depth look at all the data on living expenses in San Francisco to find out who exactly can afford to live there. San Francisco’s crazy high cost of living starts with its crazy hot housing market. Simply put, affordable housing is hard to come by in SF. According to data from the National Association of Realtors, existing home sales prices increased nearly 36% in just two years, from $543,780 in 2012 to $737,600 in 2014. That $737,600 represents the second highest average sales price in the U.S., behind nearby San Jose. There is one upside to surging home prices, however. 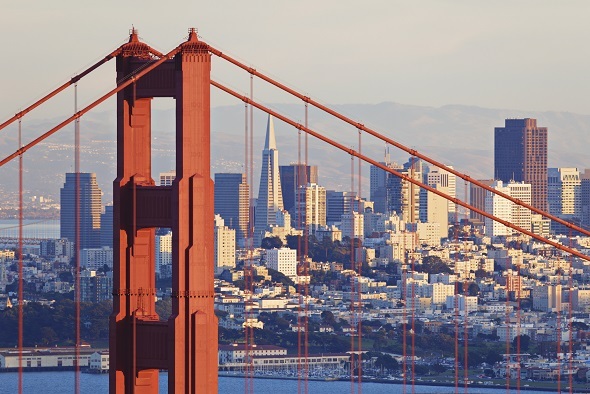 Homeowners in San Francisco have earned huge savings through refinancing in recent years. If you’re thinking about buying a home in San Francisco, one of San Francisco’s top 10 financial advisor firms can give you some financial guidance on how to navigate the city’s surging home prices. So have those high home sales prices begun to spill over into the rental market? In a word: yes. According to rental listing site Zumper.com, which tracks average market rents on a monthly basis, rental rates in San Francisco are the highest in the country. 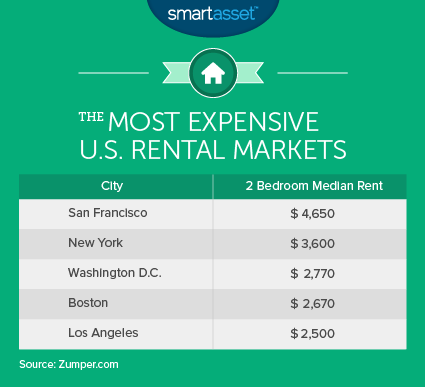 Average rent on a two bedroom apartment in San Francisco is $4,650, $1,000+ more than the number two city (New York) and $2,000 more than the rest of the biggest cities in the country. If you are lucky enough to secure some affordable housing in San Francisco, you’ll probably want a way to get around. According to the U.S. Census Bureau, nearly 80% of workers in San Francisco have at least one car available to them. But owning a car in San Francisco can be an expensive proposition, especially if you live or work in high density neighborhoods like Chinatown or the Financial District. While free parking can generally be found outside of the city center, if you need regular access to parking downtown, you can expect to pay daily rates of $20 or more to park (or monthly rates between $200 and $400). Another major expense of car ownership in San Francisco is gasoline. The average price of gas in San Francisco is typically much higher than the U.S. average. According to gasbuddy.com, the average price for a gallon of gas in March 2015 was $3.37 in San Fran, compared to a national average of $2.43. That’s a 38% difference. If you’re willing to give up your wheels, the best way to save money on transportation in San Francisco is by using the city’s public transportation system. A monthly pass for bus and cable car service can be purchased for just $68, while a pass that also gives access to BART (Bay Area Rapid Transit) trains within San Francisco costs $80. Both of those passes are far less expensive than the transportation passes in other major cities, like Chicago ($100) and New York ($116.50). Eating out in San Francisco can be very (very) expensive. It is recognized for having some of the best restaurants in the world, run by some of the finest chefs in the world, but even if you’re not eating at one of those places, prices are still high. According to the cost of living website numbeo.com, a meal for two at a “mid-range” restaurant in San Francisco costs $80, nearly double the national average. Of course, for the budget conscious eating at home is always the best choice. Home cooking may be a good way to save money in San Francisco, but it isn’t necessarily cheap. 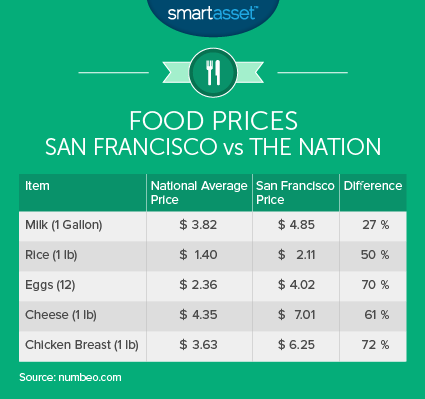 The table below shows the average prices of some typical groceries in San Fran and the rest of the country. When considering a full selection of food items, the picture does not look any better. According to the Council for Community and Economic Research, the overall cost of food in San Francisco is 23% higher than the national average. One of the largest expenses for many Americans is health care. Doctor’s visits, prescriptions and other medications, preventive care and hospital stays can all be expensive, even for those who have health insurance coverage. Health care in San Francisco is more expensive than average. Castlight Health found that the average doctor’s visit costs $251 in San Fran, but can cost as much as $460 in specific locations. That $251 figure is the highest of any major U.S. city. Overall, healthcare costs for the typical San Franciscan are about 20% higher than the U.S. average. There can be an upside to all the added expense. If you can use a credit card responsibly (aka pay off your bill in full each month and avoid overspending), you can get some money back for spending what you would anyway. Picking a rewards credit card that matches your spending patterns can maximize that impact. You can check out the best rewards credit cards here. So you’ve decided you’re moving to San Francisco. You probably want to see how your budget will be affected. SmartAsset’s California paycheck calculator can help you determine how living in the Golden State will impact your take-home pay. If you want help with how it will impact your finances or are looking for someone to help you meet your financial goals in general, a financial advisor might be useful. A matching tool like SmartAsset’s can help you find a person to work with to meet your needs. First you answer a series of questions about your situation and your goals. Then the program narrows down thousands of advisors to three fiduciaries who meet your needs. You can then read their profiles to learn more about them, interview them on the phone or in person and choose who to work with in the future. This allows you to find a good fit while doing much of the hard work for you.